The Big Guy and I are seasoned travellers. If you live in a different country from either of your families, you have to get used to the rhythm of packing, transport, and departure times. Where we can, we take the train; it has a much better rhythm – with a continuity of movement, both in terms of the motion of the carriages, and because there is no hanging about in a departure lounge, or being forced through an array of harshly lit shops. The train gets you where you need to be without fuss; you have space to sit comfortably and to move around. One of the things that we haven’t got the rhythm of is taking our own food. Although, I do know exactly where all the best places to buy food along the journey are. We have recently returned from one such trip abroad, although this time, we had a leg of the journey on a coach. It was OK, but I will be glad if they ever sort out the troubles on trains run by a certain rail company, which has been unable to run for far too long now. We decided that we should be better prepared for this journey. Since our usual rhythm was interrupted, I could not guarantee getting to my favourite pit stops. I also had a few ingredients in the fridge that wouldn’t last until we returned. So, the obvious choice was to make something to take with us. A picnic, of sorts. I had a little of the salad, some cream and some eggs that needed using up from the dinner I made for friends, and a few last sprigs of chervil. As so often happens, the day before I was leaving I woke up and knew that these would be perfect in a tart, with some goat’s cheese. We could have some for dinner that evening, and then we could take the rest as a picnic for the coach the next day. Like many of the best laid plans, the idea for a nice goat cheese went a bit awry. It was a bank holiday, and none of the usual shops were open, so I had to dispatch the Big Guy to the supermarket. Unfortunately, all they had in the way of goat cheese was some presliced stuff, that could have been any generic cheese. It certainly never has the tang of goat that I was looking for in this dish. Fortunately, he returned with some sharp, crumbly feta instead. This was a much better option, it needed to match the asparagus. The tart was tasty, filling and survived the journey. So did the salad we had with it, because we dressed it en route from a small jar. This is my top tip for picnic salads – if you dress it before you travel, the salad will cook in the acid, and you will be left with a container full of flaccid disappointment. I know I have entered my dishes into a lot of blog hops lately, but I couldn’t resist entering this recipe into the inaugural Cheese Please Challenge, hosted by Fromage Homage. Then I heard about the inaugural Four Seasons Food, dreamed up by Anneli at Delicieux and Louisa at Chez Foti. This dish is so apt for both. This was my perfect public transport picnic, and I didn’t waste anything in my fridge. I’d love to hear what appears on your picnic blanket, or even coach seat when you make food for on the go. Season the flour. I wanted this pastry to taste peppery, the rest of the tart can hold its own. Don’t be afraid of adding more pepper than you think. Rub the cold butter (it needs to be fridge temperature) into the seasoned flour until you have a breadcrumb consistency. Add the egg yolk and bring together into a dough. If you need to, you can add a little bit of cold milk to make it all come together. Add a splash at a time. Form a disc with the dough, and cover it with cling film or foil, and leave it to rest in the fridge for 20 minutes to an hour. Heat the oven to 200°C. Roll the pastry out thinly on a floured surface. Carefully line a greased flan case with the pastry, and press into the sides or fluting with a small offcut of pastry in a ball, to avoid any tears or holes, you don’t want the filling to leak and burn on the bottom. Prick the bottom of the pastry all over with a fork. Line the pastry with greaseproof paper, and add a good layer of blind bake – this can be ceramic beans, dried beans or rice – to give some weight help keep it flat and thin. Bake in the oven for 15-20 minutes, or until the pastry looks dry and is beginning to brown on the sides. Remove the blind bake, and put back in the oven to allow the pastry to cook all over to a light golden colour. While the pastry is browning, whisk together the cream, eggs, and chervil. Once the tart case is cooked, remove and turn the oven down to 180°C. Pick the salad over to remove any leftover capers and cornichons. Scatter the rest over the tart case, so that you get pretty even cover. Then scatter over the spring onions and crumble the feta around, again, so that the coverage is quite even. Pour the eggs and cream over the rest of the filling, shaking the case a little, to ensure even distribution. Return it to the oven and bake for a further 30-40 minutes, or until the centre is just set, but still has a little wobble if you shake it. 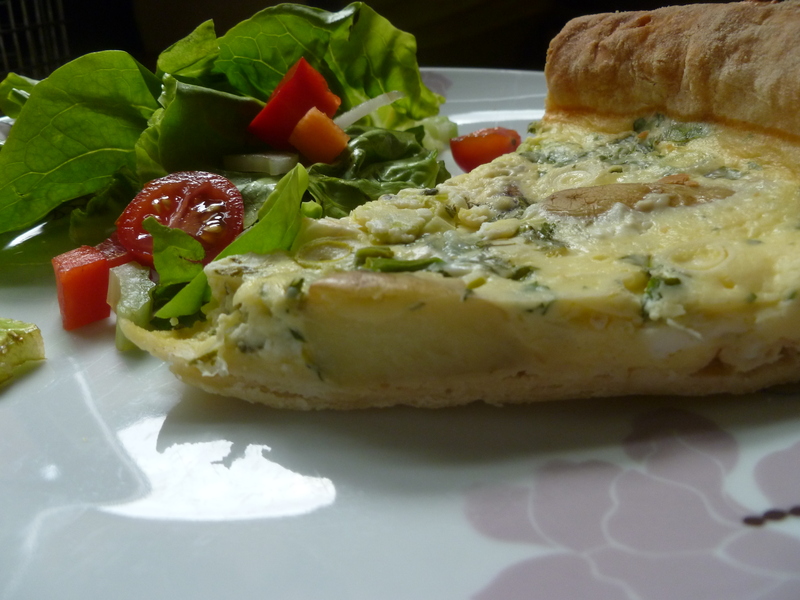 As with all quiches, this is great served hot or cold, but if you want to serve it warm, let it rest for about 10 minutes after it comes out of the oven, so that the filling does not ooze all over the plate. I may have already mentioned how inspired I was by the Rollende Keukens (only once or twice…). I ate so many good things there, that I am now experimenting with. 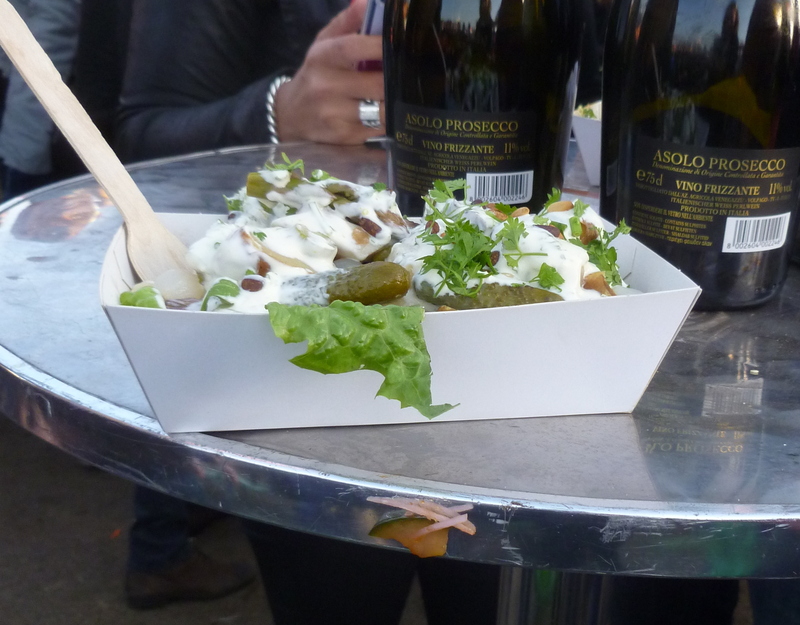 Nestled in amongst the stalls, was the Bar d’Asperge, which sold all manner of brilliant dishes with asparagus; from the Dutch classic – white asparagus with ham, egg and a bechamel sauce, to grilled green asparagus, pasta salad and all manner of other things. I was in search of something on the healthier side to counterbalance all the barbecued goodies that the Big Guy was queueing for. We were both also hungry, so I wanted something substantial, too. I came across this lovely salad, which contained potatoes, white and green asparagus, mushrooms, capers and cornichons. As the lady served it to me, she smothered it in a dressing, casually mentioning it was home-made. 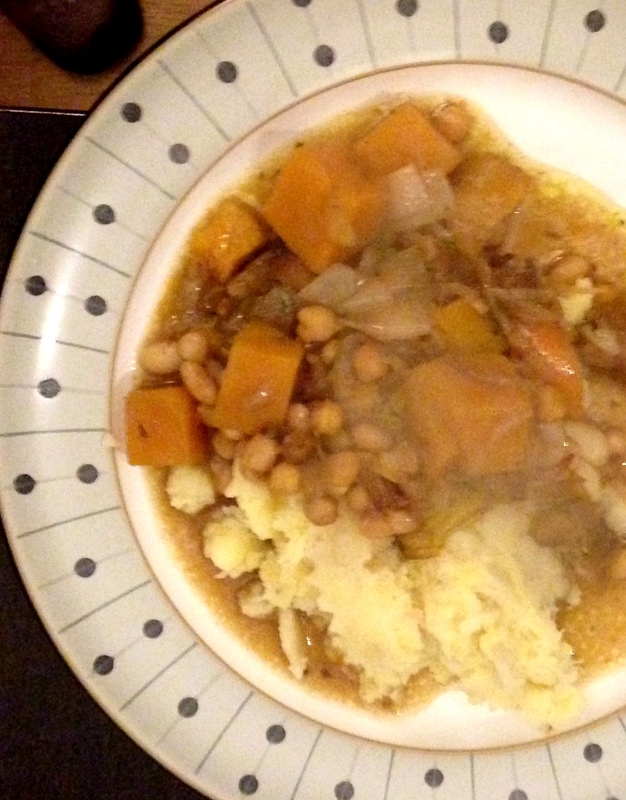 It was good – creamy, rich and spiked with chervil. Asparagus and chervil: if ever a herb were meant to go with a vegetable, it would have to be these two. I tried many things at the Rollende Keukens, but to be honest, I don’t remember much else from the first day that I went there. This salad, and this sauce have consumed the rest of my memories. I knew I had to recreate it, and I knew that I would need to do a bit of research first. A lot of the sauces I looked at were stock based, and thickened with cream. This dressing certainly had sour cream, but was sharper and fresher than that. I thought that you would need the thickness of a mayonnaise to give the sauce its consistency. I also knew that a shop-bought mayonnaise would make it too claggy. Then I remembered that it was perfectly possible to make mayonnaise yourself, and I could make it at the thickness that I felt appropriate. And so, a homemade mayonnaise with a neutral-tasting oil was my starting point, and it went really well from there. This salad, and the sauce went perfectly with the chicken ballotines that I stuffed with asparagus mousse. I am not a fan of white asparagus, so I left it out. The original salad also had silverskin onions in. I am not a huge fan of these, either, as I prefer the sharp tang of a home-made pickled onion to the sweetness of these tiny alliums. I hope that you have a go at this sauce, I know a lot of people are put off by making a mayonnaise, but with this amount of oil, there shouldn’t be a problem, as long as you add the oil in very small amounts, and whisk it well in between so that it all of the oil is incorporated into the emulsion before you add the next lot. As this dish makes use of one of my favourite herbs, I’m entering it into Herbs on Saturday, by Karen at Lavender and Lovage, which is being hosted this month by Anneli at Delicieux. You probably won’t come across chervil in the supermarkets, so look out for it at markets and farm shops. Or, even better, get hold of some seeds; it is one of the easiest of all of the herbs to grow from seed, the flavour is more intense, it has beautiful white flowers that are also tasty and will seed itself quite happily – if you don’t eat all the flowers first. The proportions that I mention here are approximate. You can also adjust or add to your taste, things such as silverskin onions, hard-boiled egg, different mushrooms (Morels would be great if you can find them), spring onions, and probably many other things. First make the dressing. Start with an egg yolk in a mixing bowl. Add the Dijon mustard, a pinch of salt and a good squeeze of lemon juice, and whisk together well. I did this by hand, because the heat from a food processor or stick blender is enough to scramble one egg yolk. You need a little lemon juice, because the you are essentially making an emulsion, and the acid helps to stabilise it, and stop it splitting. Don’t worry if you don’t think it is enough, you can add more later. Then slowly add the oil, a little at a time. Make sure that it is well incorporated into the egg before you add more. Keep doing this until the oil is finished, or you think that you have a fairly thick mayonnaise. The exact amount that you’ll need will depend on the size and the age of the yolk. Once you have a thick mayonnaise, whisk in the sour cream. Stir in the chervil. Season with salt, and taste to see if it is sharp enough for your tastes. If it isn’t, squeeze some more lemon juice into the mix. Set aside to allow the flavour to develop. Boil the potatoes until they are just tender. Drain and set aside to cool. Cut the mushrooms into quarters, grind over some black pepper and salt, and fry in a little oil or butter until the mushrooms have given up their moisture. Break off the woody ends from the asparagus, and cut into 5 cm chunks. Blanche in boiling water for no more than 3 minutes, you want the asparagus to retain some bite. Refresh in iced water, or by running the pieces under a cold tap. Drain, and add to a salad bowl. Cut the potatoes in half. I did mine on the diagonal for interestingly shaped salad. Add to the salad bowl, along with the mushrooms, capers and asparagus. If the cornichons are really tiny, add them whole. If they are slightly larger cut them in half lengthways, or into large chunks. Stir well. Serve garnished with chervil leaves and with a generous helping of the dressing. This year is the first year that I have been able to harvest my own asparagus. As you must, I planted four crowns two years ago, and it has been an agonising wait. I also thought that I’d been a little over zealous with the first harvest. I waited until I had a good few stalks, and before they got too long, then I plucked them all with the eagerness of a beaver who had just been presented with his own river that runs through a hardwood forest. I had the first batch simply steamed, and accompanied by a soft-boiled egg. And then I waited. And waited. And the anxiety rose. And I started to worry that, having waited so long to crop them, I had been too impatient or greedy and that I would have to plant more crowns and wait another 2 years. 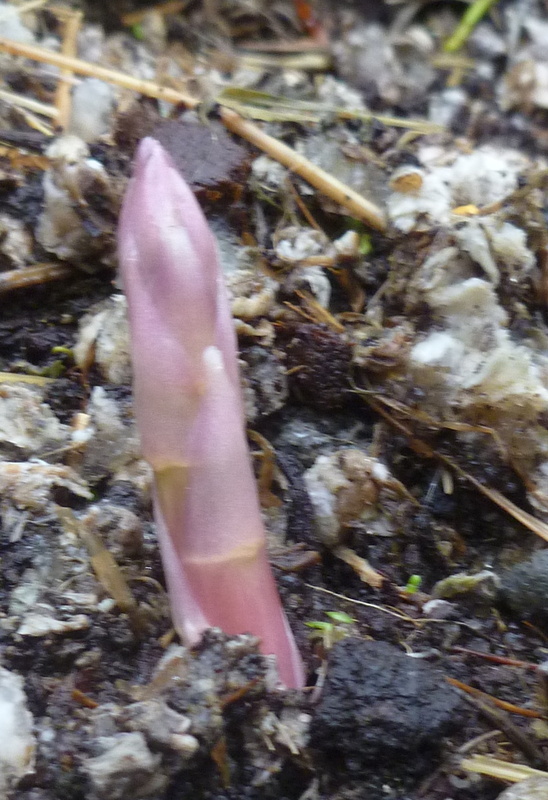 And then I went into the garden this morning, and was delighted to find this stalk poking its way through the soil and mulch. I will have more home-grown asparagus again this year, after all. I had a few friends round to dinner at the weekend, which coincided with my panicky dearth of my own asparagus. But, I really wanted to make asparagus the star of my main course, given that it is only with us for such a short time. 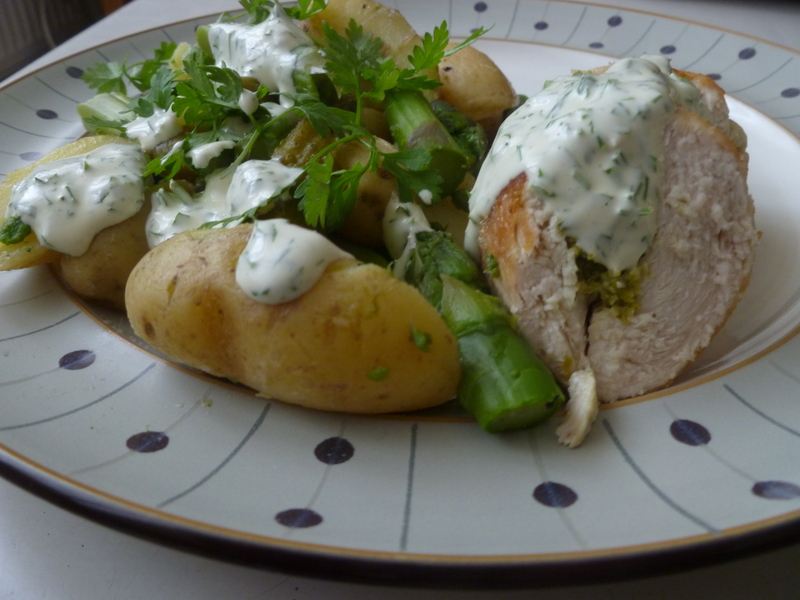 So I dreamed up a main course that consisted of an asparagus salad, and a ballotine of chicken, stuffed with asparagus mousse. I have to admit, the food was lovely, seasonal and fresh, but my ballotine-making skills definitely require honing. They were not the most beautiful, and one or two lost some of the stuffing. But my guests enjoyed them, so I guess that is what matters. I also made far too much mouse for the number of chicken breasts (and, indeed, guests) I had. 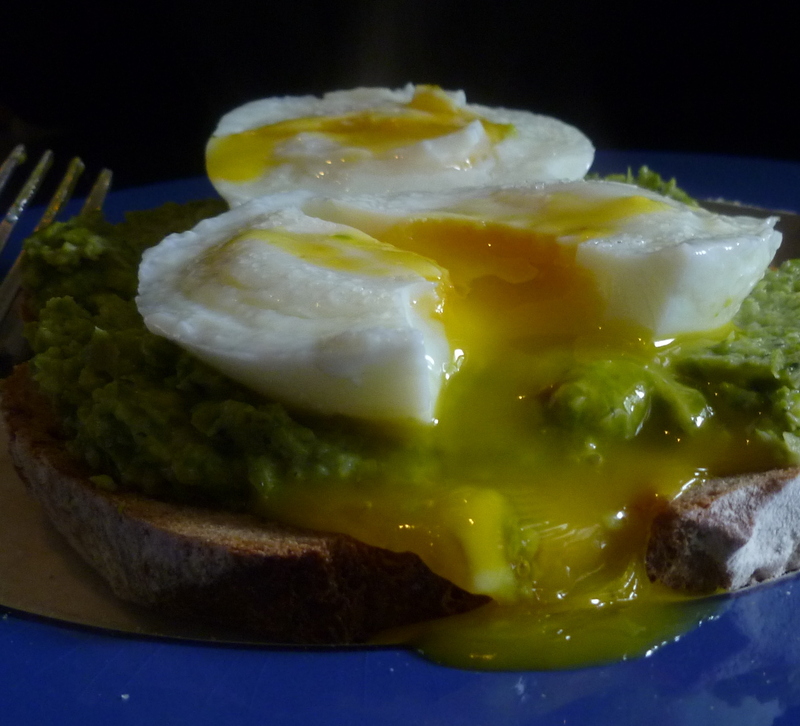 So, the next morning, I cooked up the rest in a water bath, and had it for breakfast on some sourdough toast and topped with a poached egg. It was a great breakfast. I can also imagine this mousse served as a starter, with crayfish, or maybe even lobster, if you want to push the boat out. I can’t get enough asparagus at this time of the year, and of course, there is never any waste, because I always use the woodier ends to make soup. I can eat them simply, or in recipes. But I’m always looking out for new recipes to make and to inspire. We have a few more weeks of the season left, so if you have some great asparagus recipes, link them up in the comment section. 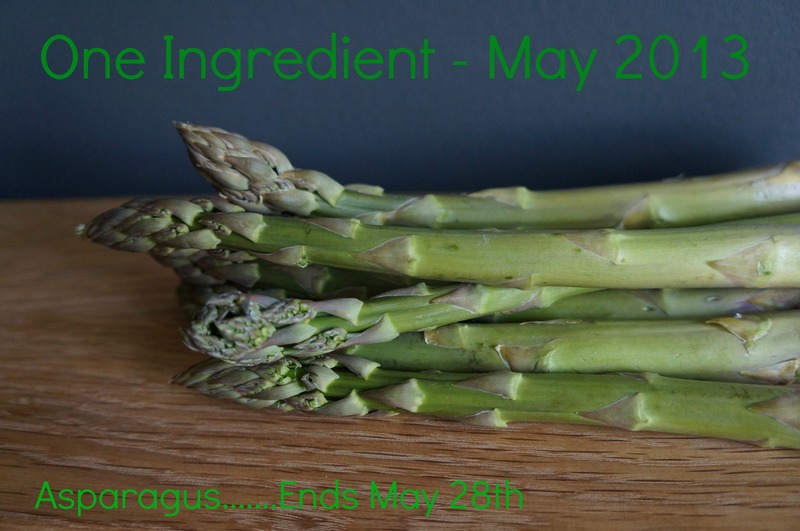 I’m also entering this into Ren Behan’s Simple and in Season, since there is nothing more seasonal than asparagus right now; and into One Ingredient, hosted this month by Laura at How To Cook Good Food since it is really appropriate right now. Remove any woody ends from the asparagus, by gently snapping them. As I have mentioned, no need to waste this bit, it may not be good to chew in a dish, but makes a great soup, or you can add it to vegetable stock, for an additional chlorophyl hit. Cut the asparagus spears into 3-5 cm lengths, and blanch in boiling water for about 2-3 minutes, depending on the width of the stalks. Refresh immediately under a running tap, or in iced water. You don’t want them to continue cooking, as they do cook for longer later in the process. Soften the shallots and the garlic in the oil, until they are translucent. Keep them moving, so they do not catch. I always find that shallots will burn much quicker than onions. 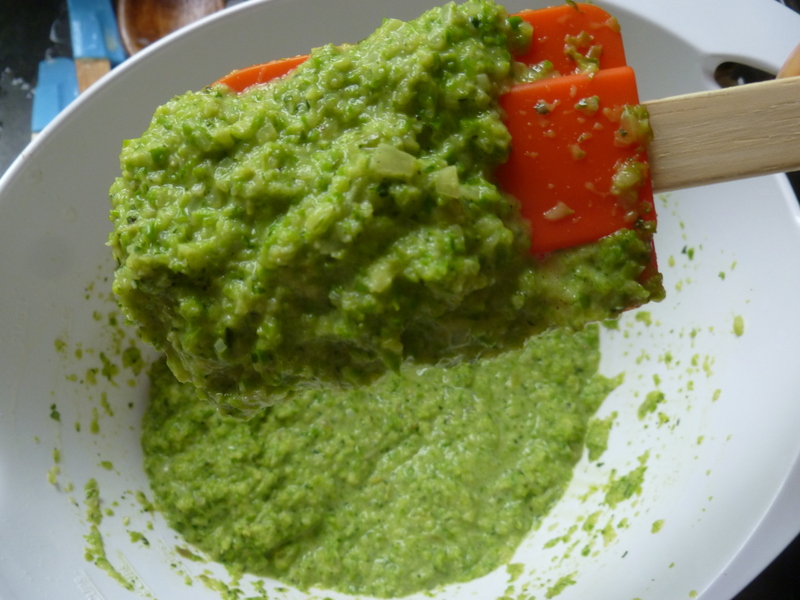 Once they are done, blend up with the asparagus, and the roughly chopped chervil. If you want to be really cheffy, you’d blend them then pass them through a drum sieve or something similarly fine. I am less cheffy, and was perfectly happy to have a bit of texture in my mousse, so I blended it up as fine as I could get it in my food processor. Beat the eggs and cream together, and stir in the asparagus mixture. The mixture should be pretty thick for a stuffing, but you could thin it with a little more cream if you intend to make a mousse. Season it really well. It will need it. Then you can either use it to stuff meat, which should be poached gently in water or stock; or you can put it into greased ramekins or dariole moulds, and cook it in a bain marie until it is just set. The time you need will depend on the size of your mould. It took me about 20 minutes, but I was using pretty large ramekins. If you have greased your dish well enough, you should be able to turn it out. I did this, but decided that I wanted to serve it on toast, and you’ll find it also spreads nicely. 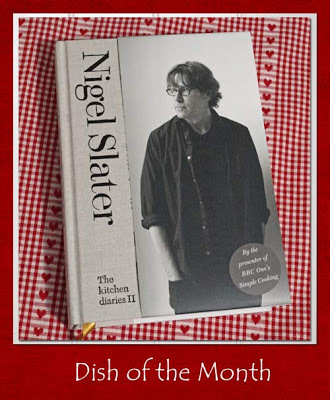 A couple of weeks ago, I found out that a few fellow bloggers had, like me, received Nigel Slater’s Kitchen Diaries II. Like me, they had also read it cover to cover, and enjoyed it as much as his first diary (which I have also read; I’m afraid my shelf life is too short for 50 shades, when I can fill my head with the sights, sounds and smells of food). Unlike me, Janice and Susan decided to pay him homage by hosting the Dish of the Month in his honour. Obviously, I was keen to join in, whilst cursing the fact that I hadn’t thought of it first! I decided to cook from both books, on alternate months. Originally, I had intended to cook things I haven’t tried before from each of the books in turn. However, I was cooking stew for my new team, because I could make it the night before. One of them professed a love for beans and chickens. And just like laid plans, and mice; my intentions gang aft agley. Once I knew of these preferences, I had to cook the humbly-named Chicken Stew and Mash from Kitchen Diaries (p.79). It has become a favourite. Although it uses winter seasonal vegetables, it tastes a bit like summer. Two of my team are vegetarian. And you know me, I had to make them feel as welcome as the others. So I needed a veggie stew. But couldn’t get away from the thought that this stew was the one I wanted to make. So, I had to come up with a vegetable version that would still hit the citrus and savoury spot, but with the same depth of flavour as the meat version. The depth came from caramelised onions. The bulk came from pumpkin, as being in season, and good with orange. And a few chickpeas, because I had some that I’d cooked and frozen previously. What I ended up was reminiscent of the original stew, with the savoury, citrus, and sweet tones from the orange, herbs and balsamic vinegar; but by necessity was pretty different. Since Nigel himself says in the introduction to Kitchen Diaries II “neither am I someone who tries to dictate how something should be done, and I am never happier than when a reader simply uses my recipes as inspiration for their own”, I think he won’t mind too much, do you? If you’d like to enter Dish of the Month, then you can find the full details over at Farmersgirl Kitchen or at a Little Bit Of Heaven On A Plate. Add your post to the linky there, so that we can all see what dish you’ve chosen. If you are using dried beans and chickpeas, soak them in plenty of cold water overnight. Cook them in fresh, unsalted water. They will cook further in the stew, so make sure they are not soft when you drain them. Nigel and I agree on about 40 minutes. Some of the depth of flavour in Nigel’s version of this stew comes from the Maillard reaction that occurs as the meat browns. I had to replace this somehow, and probably the best way is to allow onions to caramelise really slowly until they are brown. As they started to turn golden, I added the herbs and the bay leaves. As the onion reaches a deep brown, add the garlic cloves and the orange rind, and cook for a further minute. Add the flour, and mix it in well, followed by the juice of half an orange once you’ve cooked the flour through. Add the squash and the beans to the a deep casserole dish with a lid, then add the cooked onion and flour mixture. In the same pan as you browned the onion in, soften the leeks, being careful not to burn them. When you can separate the concentric rings, they are about ready. Add the juice from the rest of the orange, balsamic, and about 500 ml of veg stock to the softened leeks. You can also add a pinch more of the herbs de Provence too, if you feel it needs it. I did. Bring all of this to the boil, season generously with salt and pepper, and then pour this over the vegetables in the casserole dish. You want the liquid in the pan to come about three-quarters of the way up the vegetables, bearing in mind that the veg themselves will give off extra liquid as they cook. If you need more liquid, add more vegetable stock. I return to Nigel’s instructions, and recommend that this is also served with a big pile of creamy mash – potatoes, or a mix of potato and celariac – so that the juices can form little puddles in the mash. Most Fridays, I go foraging with a small group of great people. 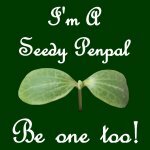 You may remember that I met one of them back when I did the seed workshop. One of them, Jennie is a herbalist, and we are learning a lot about the medicinal and culinary uses of wild plants from each other, and we all share good spots to find useful ‘weeds’. On the last forage of last year, we hit gold, despite the cold. We found a huge stash of Japanese quince, or Chaelenomeles Japonica fruit. The Japonica is usually grown for its beautiful flowers, as many people have no idea that the fruits are so delicious, or so beautifully scented. At this time of the year, the fruit are pretty obvious, although I used to assume that they were ordinary bushes that some kindly person had studded with apples for the benefit of the birds in winter. Of course, this is a valuable winter fruit for the birds too, so if you do come across some yourself, then make sure you don’t take them all, as the birds will appreciate them, especially after they have bletted well. In fact, you will also think that they are better for a good bletting. Like their rosaceous namesakes, they are not at all good when you eat them raw, but they are delicious when cooked in pies, baked or as preserves, and they are really high in pectin, so great for this purpose. The Japanese quince is thin skinned, and has a lot of small seeds. I removed all of the seeds, and put half in a muslin bag for two types of jam, for the pectin. The other half I kept, and some of these may well find itself wending its way around in the next round of Seedy Penpals, which will be coming up shortly. The fruits are also beautifully scented, and they have been brought into homes to simply sit in a room and lend it a lovely, delicate fragrance. As I cycled around, my foraged fruit was filling my nostrils, and my living room smelled lovely for a few days before I was off to spend Christmas at my parents, when they were unceremoniously stuffed into a bag, so we could make things with them. Both quinces and Japanese quinces are used extensively in Persian and Moroccan cookery, and although I knew I was going to make jelly and jam, I wanted this to influence what I paired with them. Inspired by this recipe, I decided that I was going to make a quince jelly with tarragon, and then I could use the fruit pulp to make a different jam. I always try to use up the pulp from making jelly, and quinces make it really easy, due to the pectin. I’m pretty pleased with this jelly; it is tasty and unusual on toast or yoghurt in the morning, as well as being good with meat. This year, Christmas dinner was a gammon, which was prepared in the same way as this baked ham. I added a tablespoonful of this jelly to the gravy, which made it rich and unusual, bringing a slight taste of the Middle East to a Western meal. Sterilise your jam jars and lids, by running them through a cycle in the dishwasher, cleaning them in hot soapy water and placing them in a low oven, or by steaming them in a pressure cooker. Quarter the quince, and remove the seeds. Take about half of the seeds and wrap them in muslin for cooking with. Place the fruit and seeds in a large pan, and cover with water. Bring the fruit to a boil, then simmer them until the fruit is tender, and the perfume fills your kitchen. This will be between 40 minutes to an hour and a half, depending on how well bletted they were when you started. Drain off the water through a piece of muslin, but keep the cooking liquid, as this will form your jelly. Set aside the fruit pulp, because this will be the basis of your jam. Measure out the liquid, as this will determine how much sugar you will need. For making jelly, you take 400 g sugar for every 600 ml juice. My fruits yielded 1.3 l, so I used 860 g sugar. In a large, clean pan, add the liquid, sugar, tarragon stalks and the rinsed off muslin with the seeds in it. Heat gently, stirring while the sugar dissolves. Once the sugar has dissolved completely, bring the jelly up to a rolling boil. Don’t stir it after this. It needs to reach 104.5°C to set. You can measure this with a jam thermometer, or you can do the fridge test. I often do both. Meanwhile, chop the rest of the tarragon finely, and set aside for later. Once the jam has reached setting point, take it off the heat; remove the muslin with the seeds, and the tarragon stalks. Don’t throw the seeds away, they are useful for more jam making later. Add the chopped tarragon, and leave the jam to cool for 10-15 minutes, so that the tarragon will be more evenly distributed through the jam in the jar. Meanwhile sterilise any jugs, ladles and jam funnels that you will need to transfer the jelly into the jam jars, by covering them with boiling water. You’ll need to dry them off before use. Pour the jelly into the sterilised jars, making sure that the jam is within a couple of mm from the top of the jar. Put the wax discs on the top, wax side down. Put the lids on and tighten them well while the jam is still hot. 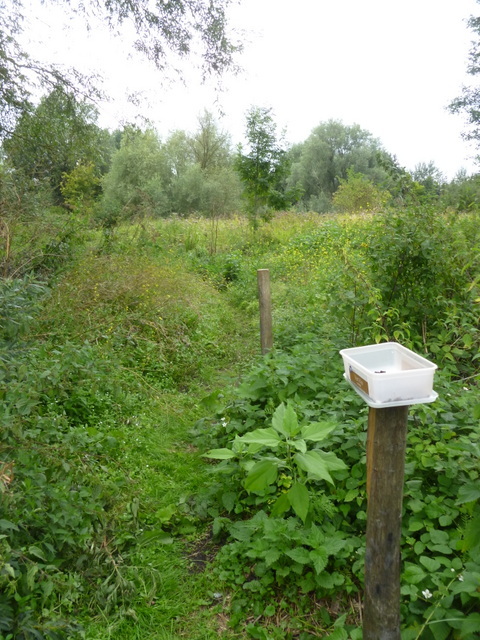 Once a week, I volunteer at an Urbania Hoeve permaculture garden. It is great fun, and I am learning a lot. Another bonus is that I have been able to experience a number of different vegetables, as well as save the seeds from them to try them in my own garden. 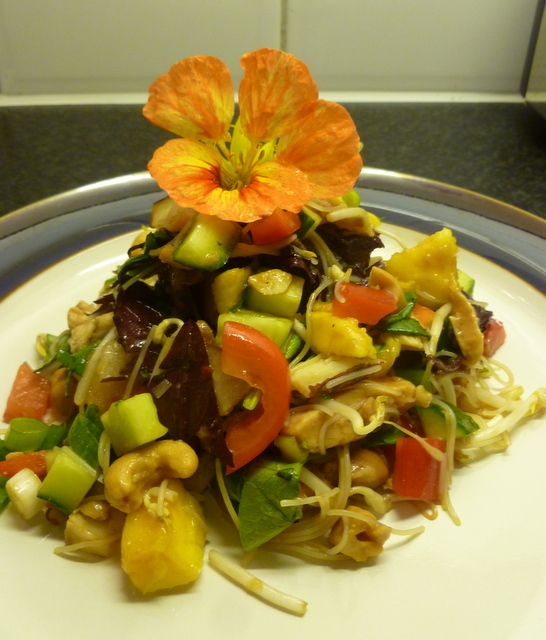 As you can see from the salad photo, I have used nasturtium (leaves and flowers) in this salad. This is not new to me, I’ve been eating nasturtium for as long as I have been growing them. Despite having called this post Red Lettuce Day, the two plants that I would like to talk about aren’t actually lettuces, but they are red, and plants that were new to me this year. The first is Perilla, or Shiso (Perilla frutescens). Although I wasn’t aware of it, I have been looking for this plant since I went to Japan for work, and wanted to have a go at growing the fragrant leaf that you find in many of their broths and ramen. They translate it as morning glory, which I was very disappointed to find isn’t edible, after I had found and started to grow it. Following a bit of a twitter storm earlier in the year, I found and grew the green version of this, and have been eating the red version from the permaculture garden. I really love perilla in salads. It has a distinctive perfumed flavour, with a slight aniseed kick. It is a pretty strong herb, so you don’t need a lot of this to provide you with a lot of flavour. It is also good in broths and gravies, and is used a lot in pickles in Japanese cookery. Orache (Atriplex hortensis) also comes in red and green varieties. You may be able to find the green version in the wild over here. In other temperate zones, it is possible to find it, but it is more likely to be a garden escapee. Like most wild greens, orache tastes very irony. It can be used anywhere that you would use spinach, raw or cooked. I have some seed saved, so I hope that I can grow some here too next year. Both seem relatively easy to grow, but they need sun, so I can only grow them in a small part of my shady garden. I don’t mind, I’m looking to use them as part of a large mix in the suitable beds anyway, and I think they’ll be fine. I hope that more people will give them a go, I can recommend them. This is an entry for the 52 Week Salad Challenge, where there has already been much discussion about red and green lettuces, and their attractiveness to slugs. I am not sure if these plants are particularly attractive to slugs in any case, but they are certainly both very tasty in my opinion! I made up a Thai chicken and mango salad with my haul from the permaculture garden, and I used fresh coconut, which has just hit the markets around here. I give the recipe below, but this is really easy to tweak if you don’t have your own permaculture garden to play in, or if you want a veggie version or whatever. For example, you can substitute Thai (AKA holy basil) or even ordinary basil for the perilla; you can swap out the orache for spinach; you can use cooked chicken without the marinade; or you can even leave it out if you would like. If you don’t have fresh coconut, use coconut flakes. It’s pretty versatile. The key components are really the dressing and the mango, with some contrasting salad flavours and crunch. Whatever salad leaves you choose will need to be robust enough to stand their own against the other strong flavours. As always, this recipe serves 2 people, but is easily scalable. Do you have any leaves you think would be good in this salad? If you are using uncooked chicken, cut down the thighs so that they are one flat piece. 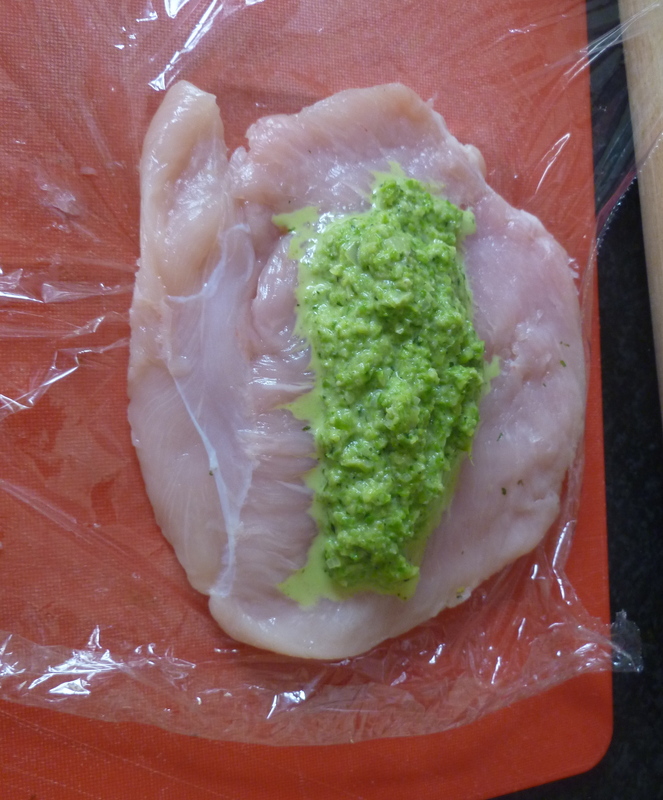 Mix together the marinade ingredients and coat the chicken pieces on all sides. Cook the noodles according to the packet instructions, drain, and plunge into cold water, to stop them overcooking. Drain again. Mix up the dressing, and add to the noodles. Dry fry the coconut, until brown and toasted. Remove from the pan, then toast the nuts in the same way. Toss together all the salad ingredients, except the leaves, and add to the noodles. Mix well. If you are using the marinated chicken, cut it up into bite sized dice. Toss the chicken and the leaves through the salad. Top each one with a nasturtium flower, and serve immediately. This makes a filling and unusually tasty salad. Perfect as an evening meal. Well, it has been a little while since I posted, which I blame on having broken my camera. It also means that I am about to do something that you should never do on a food blog, and that is publish a post without a photo of the food. I did have a corker to share, but it is lost, so you will have to wait until next I make this recipe. In the meantime, please enjoy the view from one of my favourite foraging spots, complete with convenient resting place for my containers. In this area, people have also planted a guerilla garden. It has been here as long as I have been coming, and probably longer. You may be able to make out Jerusalem artichoke in the picture, and there are potatoes, pumpkins and corn at various times of the year. There is also a lot of mint, which I think was planted initially, but the conditions in the Netherlands are perfect for this herb, and now it is running rampant. I may have mentioned that we are trying to eat healthily but with all the flavour, and one of the salads that really fits the bill is fattoush. This is a Lebanese salad that uses sumac and lemon to give a really zingy dressing. I have been buying sumac, but I’m delighted to learn that you can actually forage for this plant. It is a native of North America, but apparently it has been a popular garden and municipal plant in the UK. I shall be looking out for it here too. Despite trying conditions for many of our crops this year, our herbs have gone crazy. So, I didn’t need to forage the mint for this recipe, but at least I’d have known where to go. I don’t take any of the other plants in the guerilla garden, because they are clearly loved and cared for, but there is enough mint here to keep Cuba in mojitos for a decade. I am also proud to say that this salad contained my first ever Little Gem lettuce. Since my course back in March, I have been trying to garden according to permaculture principles. Part of this is that you try to avoid bare soil in an effort to preserve the soil microbiology, take advantage of microclimates, and to prevent the army of local cats from pooing near your veg. Based on companion planting charts that are widely available on the internet, I decided to underplant my asparagus with lettuces, marigolds, and chicory. These included red velvet, a leaf lettuce called “Australian Yellow”, a mixed salad, and the aforementioned Little Gems. Most of them have done well, apart from the red velvet. I think this is because a cat got to the spot that night I planted the seed. So with parsley and mint in abundance and Little Gems and radish doing well, garden fattoush was the salad of choice. A lot of flavour, with the potential of foraging. Could you ask more from a salad? I’d be really interested in hearing about other people’s efforts at companion planting. Do you have any particular favourites that grow well, or help against pests? Please do share them in the comments. In a frying pan, heat a little oil until it is quite hot. Fry the diced pita breads until they are golden. You will need to stir them occasionally. Drain onto kitchen paper. While the bread is frying, mix together the lemon juice and zest, the good olive oil, the sumac and the spring onion. Leave aside for a few minutes to take the raw edge off the onion. Combine the tomatoes, cucumber, salad leaves, herbs and the radish roots and leaves in a large bowl. Dress the salad with the dressing, and toss well. Add the pita bread, stir briefly, and serve immediately. Sounds appetising, doesn’t it? I’m sure you can picture this one without a photo.